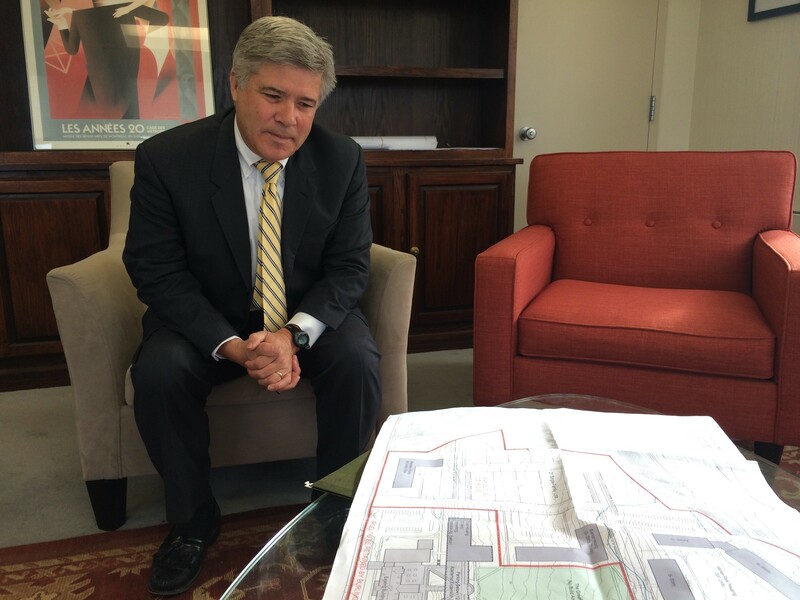 Interim president Mike Smith reviews the development plans for the Burlington College property. Burlington College is planning to sell all but seven acres of the lakefront campus it acquired just a few years ago. Interim president Mike Smith said in an interview Monday that the school needs money from a sale soon in order to survive. After what he described as a "deep dive" into the school's finances during the last several weeks, Smith said he came to the conclusion that absent an immediate infusion of cash, "Burlington College is not a viable ongoing entity." He determined that it would likely need to undergo a "soft closure," starting next year. The college, which currently has $11.4 million in debt, plans to sell 25 acres, including the land closest to Lake Champlain, for $7 million to a local developer, Eric Farrell, who intends to build a large housing development there. Under the deal, Farrell would assume the $3.5 million debt that Burlington College owes to the Catholic diocese for the original purchase of the property, and he would provide the remaining $3.5 million in cash to the college. The two parties expect to sign a memorandum of understanding on November 1. As part of that agreement, though, Smith said he'll give land-conservation groups 60 days to beat Farrell's price, in which case he'll sell it to them. "Eric supposedly put his best price there and if a conservation [group] comes in and does it and beats it, they got it." Asked why he settled on 60 days, Smith responded, "We have a cash-flow problem, and we have to close it." Whoever the buyer is, Smith hopes to close on a sale by January 2, which will also mark the end of his interim presidency. Mayor Miro Weinberger released a supportive statement in response to the announcement: "I am pleased to see Burlington College taking decisive, proactive steps to address its serious financial challenges. I support the efforts of the Board and its new management team to save this important Burlington institution. The City has a variety of interests with respect to the property - for example, an east-west public connection to the bike path is a goal that has been well-defined in multiple Parks, Recreation, & Waterfront planning efforts and documents - and we will continue to be engaged in the development and conservation discussions about the land in the months and years ahead." Under its former president, Christine Plunkett, the college had agreed to partner with Farrell in a different plan to construct housing and expand the campus. There was no signed agreement, however, and Smith said he opted to change course for two reasons. Under the previous plan, the college would have sold Farrell 16 acres and received $5 million over a longer time period (as late as 2019, according to Smith), and he determined that the school needed more money, immediately. "The problem with that is we can't wait." Smith also felt that the administration couldn't afford to devote time and resources to developing the property. "I think we need to concentrate on higher education, not development." he said. Under the current potential deal with Farrell, the college would keep enough land to build two dorms and a football field-size green. Farrell's development plan consists of 21 single-family homes, a three-story building with 75 units of senior housing, a three-story building with 60 units of affordable housing, two five-story buildings with 300 market-rate units combined and another three-story building without a designated purpose yet. Smith said Farrell's offer is close to the property's appraised value, and he decided not to open the bidding up to other developers because the school had already agreed to work with Farrell. The college currently has $300,000 in unpaid bills, and 75 percent of them are more than 90 days old, according to Smith. It also owes $735,000 in debt payments this year — an obligation it can't currently meet. "The debt service is bleeding us," Smith said, adding that, "We’ve maxed out all of our borrowing capability." The college plans to use the money from the land sale to reduce its debt from $11.4 million to $4.3 million. Smith said he discussed the plan with faculty, staff and two student representatives last Friday and concluded that "they were generally supportive."